The next morning, we awoke fairly early to go exploring the local villages, industries, and farmlands by bicycle. Anyone who knows me, or has perhaps read previous posts of mine (see Vietnam), might know that bikes aren't exactly my favourite means of transport, as although I can ride one well enough, I get nervous around traffic, or places that are difficult to steer in, and I did have to make a couple of abrupt stops that day when large vehicles passed on the narrow roads, or when the path was particularly rough and bumpy. There were no disasters though, and we were able to see some interesting places that would be inaccessible otherwise. Before starting, we stopped at a home industry, where they were making tofu, and watched the various processes the soya beans go through to become tofu. It was very hot inside, with all the vats of boiling liquid, and one guy was deep frying some of it in one corner, so we didn't linger long in that heat! I was amazed at how they can stand it all day long. We walked down some quiet village paths, with colourful houses around us, and the local guide pointed out some of the wealthier homes. We passed some fields too, both while walking and once we were off on the bikes, which were mostly rice fields, dazzlingly bright green under the hot morning sun. The paths we followed alternated between smoother and bumpier, with potholes and stones to navigate much of the time, as well as motorbikes occasionally whizzing past us in either direction. Our first stop along the way was beside one of these rice fields, where a farmer was harvesting his crops. After cutting the plants, he beats them against a wooden board to get all the grain out from the leaves. We watched him first, then each took a turn ourselves - you have to hit hard enough to get the grain out, but not so hard that it scatters off of the plastic mat laid down. We hopped back on the bikes and rode through more fields and village streets, turning so many times that I lost my sense of direction entirely (unusual for me!). After a while, we stopped at our next destination, where we stayed for a while longer. 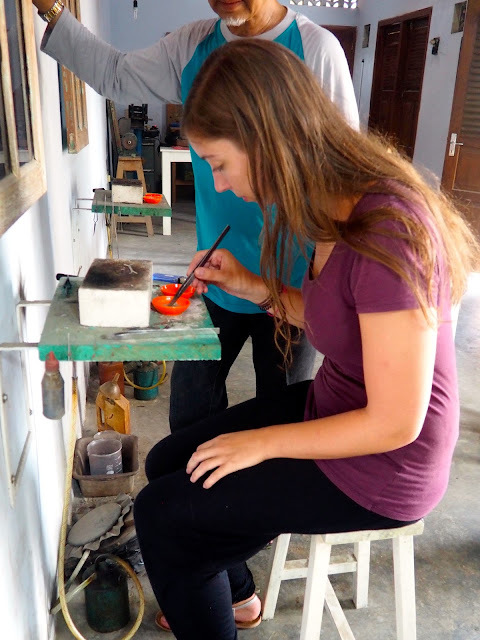 It was a local batik workshop, where one of the artists showed and explained to us how batik is made; the artists draw on their designs first in pencil, then go over the top in wax. The fabric is dyed, and the areas with wax will be left untouched. The process is repeated many times, to apply different colours to different areas of the design, or achieve different shades of a colour. The dye is fixed during the last round (usually with limestone) and boiled to remove the wax. The process can become more complicated depending on the design and the types of dye used, but that's the general idea. He explained that one piece can take from a couple of days to several weeks to complete, depending on how much detail is in the design, which is also how they are priced, by detailing not size. This workshop had about 8 artists, and about 15 staff in total who help the artists by applying the wax, dying the fabric, and removing the wax. We then had some time to browse the shops, which had wall hanging paintings, scarfs and sarongs. I wasn't sure if I was going to get something at first, as many of the designs I liked best were either huge in size, or quite expensive, but I eventually found a mid-sized wall hanging I liked that wasn't too costly. It's easy to transport home though, as they remove it from the frame and just fold up the fabric! Then we continued on the bikes to our last stop, the home of one of the best cook's in the area, as proven by her large collection of cooking competition trophies. She and her family work making tofu and tempe, and there were many packets of them stacked up for sale. We watched her cooking in the kitchen, and then got to try the tofu and tempe she made for us; I'm not usually a fan of tofu, but it was nicer with her sauce, and tempe was new to me, but also quite nice. We'd been out and about for a few hours by this point, so it was eventually time to head back into town, riding our bikes back to where we'd started with them, and taking the bus back to the hotel; I was relieved to not have to ride the bike through the busy city traffic! I took it easy that afternoon, just roaming around town a little to get some lunch - we found a cafe with the most delicious iced hazelnut latte and I basically had breakfast for lunch, with eggs Benedict and avocado toast, since sometimes I want a break from Asian food. We took a motorbike trishaw up to Malioboro Street, the most popular tourist street in the city, with its dozens and dozens of shops and street stalls selling batik, t-shirts, and other souvenirs. We only stayed long enough to get a couple of souvenirs, including my magnet, as the streets were small, narrow, and busy between the stalls, then jumped in another trishaw back to the hotel. That evening, the group all met up for an evening at the ballet - not ballet like back in Europe though! Our tickets included dinner, which was a buffet, including sate barbecue, and we all ate our fill of lots of local dishes, including trying a jackfruit appetiser, which I rather enjoyed. The ballet was the Ramayana, an epic story originating in India and spread over the world through Hinduism. It tells of the kidnap of Sita by the demon Ravana, and her husband Rama's journey to rescue her, with the help of his brother, and Hanuman and the monkeys. We were able to go backstage before the show started, to see the dancers getting into costume; each has to know several roles, as they switch parts each night, and each has to do their own hair and makeup. The most interesting part was watching the young boys, who play the monkeys, applying their makeup, which was very well done for children their age; the youngest looked about six or seven! We returned to our seats to watch the show, and I was glad to have read the story beforehand, while having dinner, so I could follow what was happening. There's no dialogue though, only dancing, so there's no issue with language barriers. The story is told all through dance and drama, but it's not like Western ballet; their movements are mostly slow and carefully placed, each step carrying meaning and significance. There were more energetic moments, like the Golden Deer prancing around, the monkeys clambering over the set, and some of the fight sequences. The most dramatic moment was definitely when Hanuman, the monkey god, sets half the stage on fire, and whirls sparklers around himself! There were a couple of moments I didn't follow what was happening, but overall I really enjoyed it, and it was interesting to see another element of local culture. The next morning was a very early start, as we shuffled out of the hotel at 5am and boarded our bus for the hour long drive to Borobudur Temple. We went early to be able to see it before it got too busy, though we were far from the only people there, and before it got unbearably hot in the middle of the day. At the temple, we ate our packed breakfasts and I got some much-needed coffee in my system before we actually started exploring. We had a local guide to show us around and tell us more about the history of the temple. It's the largest Buddhist monument in the world, and is technically a monument, not a temple, as there is no hall or any sort of indoor area. 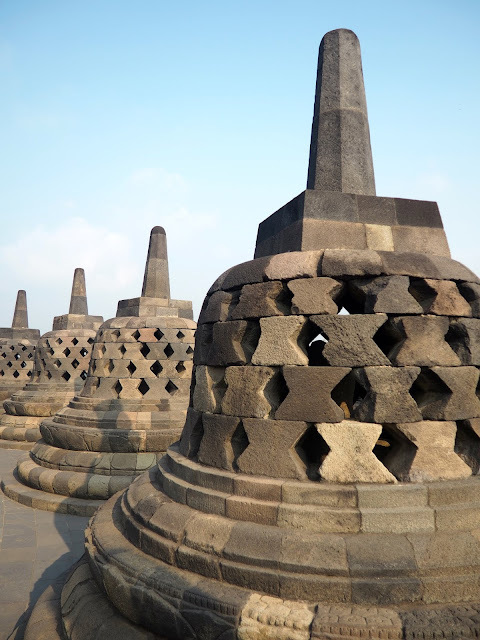 It's constructed of ten layers, which you ascend from the ground (ordinary life) to the top (enlightenment or Nirvana), and from above, it resembles a lotus flower, as the upper levels are circular, finishing with the stupa on the very top. We made our way up by walking around the levels (always clockwise), and going up stairs at different points around them, so we didn't have to do the full loop of every single level. The lower six levels are square, and are like walking along corridors with their high sides. They are covered in carvings, depicting the Buddha's life story, or aspects of his teachings. There are also many Buddha statues on top of the walls, and our guide explained the meanings of the six different hand positions. The top levels were circular and filled with stupas, some with diamond cut-outs, then square ones, showing the progression towards equilibrium, until the final central stupa, with no cut-outs, to represent perfection and enlightenment. Each stupa also contains a seated Buddha, and a couple of them are open on top, so you can see the Buddhas better on those ones. Once our guided tour was finished, we had a little time to ourselves to look around some more, take any photos we wanted and such. It turned out though, it was less about the photos we wanted, and more about the photos other people wanted with us, as we were stopped by several groups asking to take photos with us. Back in Hong Kong, I would say no most of the time, as I find it tiring, and a bit weird (though it's worse when you catch them taking photos of you without permission), but here I was polite and went along with the first few. However, when one girl grabbed my arm quite forcefully to get a selfie, I hit my limit, and refused the other requests. We descended from the temple again, and took a few more photos of it from the base, before heading back to the van and returning to the city centre. After our early start, we took a bit of time to relax at the hotel, and take a quick nap, before venturing out again. My roommate and I had chosen an optional activity for the afternoon, which was a silver jewellery making class. 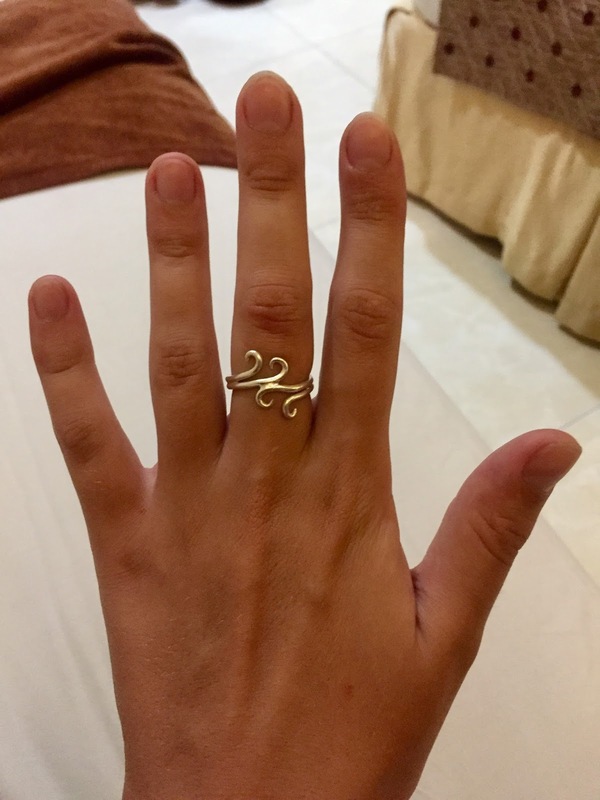 I was never good at metal work for the brief time we had to do it back in high school, but I love jewellery, and I always wear silver, so I was excited to have a personal piece that I had made (with help from the teacher obviously). I also have fairly wide fingers, though it's not too obvious since they're also quite long, but it makes it difficult for me to find rings that fit my index and middle fingers in particular, so I thought this was the perfect opportunity to get a ring made that would fit my middle finger. We were allowed 4g of silver each, with the option to pay for more if required. I didn't really have a design in mind before going, but the teacher had some of his available to browse, so I chose one of those. Mine came out slightly different, as my spirals were not as tight as his sample (see the photo!) but I preferred it that way. Mine was made from two thing strands of silver, and first I had to file their ends thinner, so the spirals would taper away. Then the two pieces were soldered together, and the ends bent into spirals. Then, I hammered the ring into its circular shape and soldered the spirals together. Finally, the ring was dropped into some sort of solution (he didn't say what for), then we cleaned and polished them. I definitely needed a bit of help from the teacher sometimes, but I also managed to do some of it on my own, and overall, I'm very happy with the design I came away with. It only took about an hour and a half in total as well, and that was with the teacher splitting his time between the two of us.